The Real John Davidson: REIGN OF ERROR WHAT DIRECTION SHOULD SCHOOLS FOLLOW? REIGN OF ERROR WHAT DIRECTION SHOULD SCHOOLS FOLLOW? 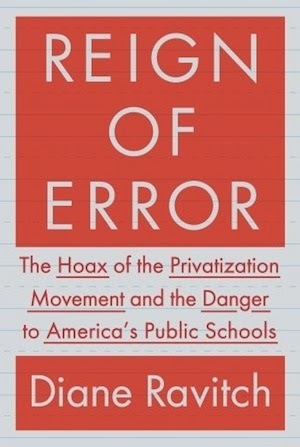 Privatization is a favorite word of some people, but when it comes to education Diane Ravitch becomes concerned. As soon as profit motivations are in control the concern for expenses shapes everything. She finds herself arguing against the likes of Bill Gates, Barrack Obama and Michelle Rhee. I put myself on Diane's side. The so called "reform" movement has decided that schools should be held accountable and that the best method is through testing to measure the child, the teacher and the school. Several objections arise. Those who are to be accounted will select students who will make them look good, in other words avoid problem students. Teachers will as much as possible teach to the test as a protection, putting other things to the side. Furthermore as has been found in several instances cheating goes on (and not just at the student level). Being accountable through tests can actually deprive youngsters of a true education. It may be unfair to brand a whole movement as evil and incompetent that has such strong public support as American charter schools. There are powerful Republican and Democratic government officials in favour of them and I might add powerful corporate figures. Diane Ravitch used to find their views acceptable, but in "Reign of Error" she attacks them. My own bias is evoked when powerful or loud people attack teachers. Are they really the problem? As I read recently everyone was a student and feels they know all they need to know about teachers. At the same time we also personally feel outsiders do not understand our job. The author points out that "reformer" advocates claim that improving education will improve poverty. She feels poverty and racial isolation are more basic to the issue and back it up with some studies. In reality many of the reformers have a hidden agenda. Conservative reformers do not trust government. They think schools should be run more as a business. They believe testing is one tool and another is the ability to fire anyone not measuring up. Some also seem to believe that teacher training is not as important as picking the right people and getting rid of the wrong. Some see an opportunity to make money and rationalize the process. Motivations also include religion which in many cases wants to stifle science. Getting back to my basic bias that teachers deserve more respect. Many teachers aside from wanting to teach, crave security, so firings can frighten off some prospects. They are not the most basic part of education--parents are. If the parents see to the health of their children and provide an atmosphere conducive to learning they will learn more effectively. With two parents working and more distractions than ever, raising children is a challenging task that few are really excellent at, including myself. Too many people feel that education should be like a business. But unlike businesses the job of schools is to work with whatever is available. In other words they don't get to choose, whether a youngster is dedicated, talented or not, all are to be welcomed and encouraged to develop their talents. Diane does offer lots of solutions to improving the American education system. Testing to common standards is desirable, but should not be the only point of school. When teachers are forced to teach to the test they are limited in meeting the needs of their students. Testing does help uncover weaknesses, but should not be used as a stick to punish those who do not control all the variables. Stability is critical to improving schools. The reformers have caused a lot of turnover, not just by firing, but by discouraging. It is important to attract good people who are properly trained. Money attracts stronger candidates, but perhaps as critical is respect. No teacher (or any professional) is perfect when they start their job, but they can all improve. Supervision, mentoring, further education can all be helpful. She disagrees with the premise that poverty and racism are just excuses for education failures. Of course exceptional people overcome all odds, but by definition most people are not exceptional. She feels the process starts before birth with pre natal care that is usually lacking amongst poor people. It continues into the pre school age health care. Nutrition is very significant. Poor people are at a disadvantage during the school holidays while their richer student colleagues more often are involved with enriching activities. To really rectify the imbalance between rich and poor means offering alternatives and at heart really dealing with the bigger issue of poverty. Diane offers a lot of research and much detail to improve education. She feels teachers are the best source for how to improve education, not relatively uninformed business people, politicians or professionals that often have ulterior motives. Any nation's most important resources are its young people, for they are the future. Here in Canada a problem is the entrenchment of retired teachers as supply teachers. It is natural for school authorities to prefer experienced teachers, especially since they probably know them personally, but how are youngsters to get started? There are lots of enthusiastic graduates of Teachers' Colleges after having been encouraged to enter find there are few jobs open to them. The Ontario government has lengthened requirements for teacher training in one effort to alleviate the problem. Smaller classes are better for students and teachers and should be a higher budget priority. Mentoring by retired and experienced teachers would open up more opportunities as well help to improve younger teachers. Awaiting these suggestions the immediate priority should be to limit retired teachers from taking the majority of supply openings.